You can find love in the strangest of places. Week in and week out I volunteer at nursing homes to lead them in Bible study. Over the years I have come to expect the occasional calls to tell me to prepare a memorial service, that someone has gone on, but never would I have expected the phone call I received a couple of weeks ago. When I picked up the phone the caller ID said the name of the nursing home and I immediately prepared myself to clear my schedule for another funeral service. But this was a different call. The voice on the other end was that of the activities director and she called to ask me if I would perform a wedding. “A wedding?” I thought, it must be for one of the nurses. No, the activities director told me that two of the nursing home residents had fallen in love and wanted to speak to me about marriage. That it was love at first sight. Well kinda. You see both Judy and Ralph are blind and it was through all those conversations over a meal, and listening to the television; all those shared feelings while they were talking about their hopes and dreams as they sat side my side her on her walker and he in is wheelchair. All those sweet conversations lead to love and Judy and Ralph wanted to be married. With only two weeks to pull it off the nursing home staff jumped into action. They provided the decorations, got the cake, and invited all the other residents to be a part of a wedding. Nothing they had ever had in the nursing home. Rev.Glynn Ferguson from Sensational Ceremonies called friends in the wedding industry to help make this one-of-a-kind wedding a reality and worked his magic with words to create the perfect ceremony for two septuagenarians. Debra Roberson with Atmosphere’s Floral wove together beautiful florals for the bride and groom; flowers, even though the bride and groom couldn’t see them, smelled incredible. 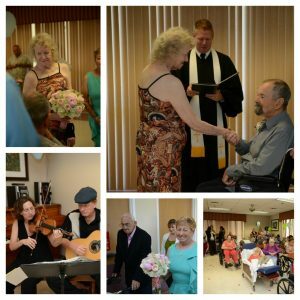 Jennie Rudberg and Craig Thompson played beautiful music on the violin and classical guitar, while Edmund Rhodes used his talented eye to capture every moment on film for family and friends..
Ralph took his place in his wheel chair and Judy was escorted down the aisle by the head of the nursing home. Former roommates of both residents stood in as best man and maid of honor. Vows and rings were exchanged before Rev.Ferguson pronounced them husband and wife and the nursing home erupted into applause and tears as the bride and groom kissed. Thanks to all those who believed in love and believed that Judy and Ralph could get married, even at this stage in their life journey.